In a special press conference held this Wednesday, it was announced that an effort between a number of Ohio law enforcement agencies has lead to over 300 arrests in Cleveland. The organizations involved in the first phase of Operation We R CLE includes: Cleveland Division of Police, the Adult Parole Authority, the United States Marshals Service, the Ohio State Highway Patrol, the Bureau of Alcohol, Tobacco, Firearms and Explosives, the Federal Bureau of Investigation, the Drug Enforcement Administration, the Cuyahoga County Sheriff’s Office, the Cuyahoga Metropolitan Housing Authority, the Cuyahoga County Prosecutor’s Office and the United States Attorney’s Office. 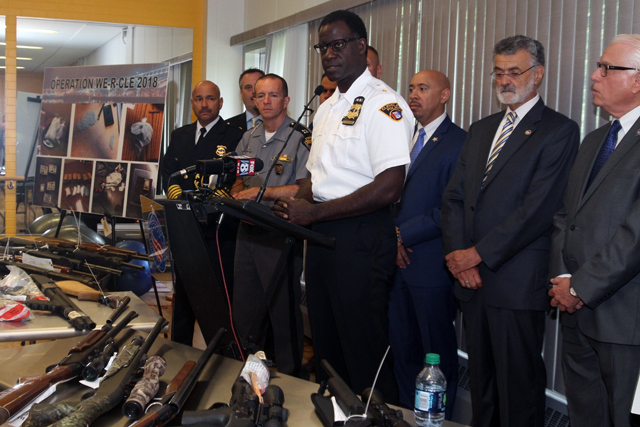 The effort to curb and prevent gun violence on the east side of Cleveland has lead to a staggering 175% increase in gun related arrests. Additional statistics include a 37% drop in homicides in targeted areas of Cleveland, with a 20% drop in homicides across the city. Phase two of the operation is currently underway, with more information being shared at a later date.